A memorial garden which opened last month to remember victims of the London bomb attacks was to close on Sunday. 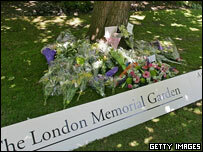 Thousands of people visited the London Memorial Garden which was established in the Victoria Embankment Gardens days after the 7 July bombings. An official plaque will be unveiled under the Indian bean tree next week as a permanent memorial. Condolence books signed by visitors to the garden, including Prime Minister Tony Blair, will be archived. The memorial plaque will read: "Under this tree people of all faiths and nationalities, united in grief, laid wreaths in memory of those killed on 7th July 2005, following the attacks on London's public transport system. "The City will endure - it is the future of our world. Ken Livingstone - Mayor of London. "For all Londoners in our great city. Cllr Simon Milton - Leader of the Council." Cllr Robert Davis, of Westminster council said: "The London Memorial Garden was a beautiful green spot where residents and visitors could quietly contemplate the terrible tragedies and pay tribute to the dead and injured. "The plaque will be a permanent reminder of those times". Motorcyclists taking part in a Unity Ride were expected to visit the site before it was due to close at 2030 BST on Sunday. Riders were planning to lay wreaths at the four bomb sites before holding a minute's silence at the memorial garden.